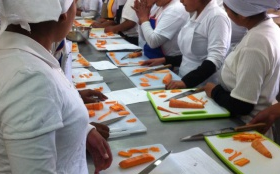 The cooking schools of Buen apetito train youth between 16 and 28 in vulnerable and risk situations in El Alto, to become a chef and to promote the traditional cuisine through the (self-sustainable) restaurant linked to the cooking school. This will lead to a healthier lifestyle and an increase in the demand for locally produced food. With help of the Nationale Postcode Loterij (Dutch Lottery Funds), ICCO could enable 10 out of 12 cooking schools to train 3.000 young chefs. Being part of something bigger. Part of the Buen Apetito project, is also to raise awareness on the richness of Bolivian locally produced products, aiming at improving the unhealthy nutritional habits of the inhabitants of El Alto. To reach a broader social impact, Buen Apetito participates in the gastronomic movement ‘Movimiento de Integración Gastrónomico Boliviano (MIGA)’ initiated by ICCO South America and partners.